Avery Publishing Group, 9781594633515, 304pp. For decades physicians delivered the diagnosis of ADHD to patients as bad news and warned them about a lifelong struggle of managing symptoms. 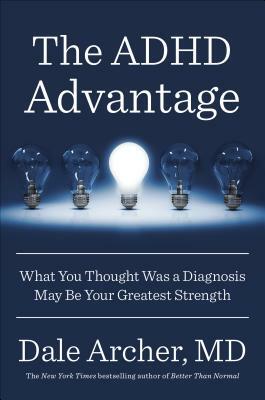 But The ADHD Advantage explodes this outlook, showing that some of the most highly successful entrepreneurs, leaders, and entertainers have reached the pinnacle of success not in spite of their ADHD but because of it. Although the ADHD stereotype is someone who can t sit still, in reality people with ADHD are endlessly curious, often adventurous, willing to take smart risks, and unusually resilient. They are creative, visionary, and entrepreneurial. Sharing the stories of highly successful people with ADHD, Dr. Archer offers a vitally important and inspiring new way to recognize ADHD traits in oneself or in one's loved ones, and then leverage them to great advantage without drugs. As someone who not only has ADHD himself but also has never used medication to treat it, Dr. Archer understands the condition from a unique standpoint. Armed with new science and research, he hopes to generate public interest and even debate with his positive message as he guides the millions of people with ADHD worldwide toward a whole new appreciation of their many strengths and full innate potential. A distinguished fellow of the APA and the Psychiatric Medical Director for Lake Charles Memorial Hospital, DALE ARCHER, MD, has treated thousands of patients over his twenty-seven years in private practice. A media veteran, he has appeared on most of the top national news shows discussing various psychological issues. His first book, Better Than Normal, was a New York Times bestseller.